In late medieval England, cloistered nuns, like all substantial property owners, engaged in nearly constant litigation to defend their holdings. They did so using attorneys (proctors), advocates and other “men of law” who actually conducted that litigation in the courts of Church and Crown. However, although lawyers were as crucial to the economic vitality of the nunneries as the patrons who endowed them, their role in protecting, augmenting or depleting monastic assets has never been fully investigated. This book aims to address the gap. Using records from the courts of the common law, Chancery, and a variety of ecclesiastical venues, it examines the working relationships without which cloistered nuns could not have lived in fully enclosed but self-sustainingc communities. 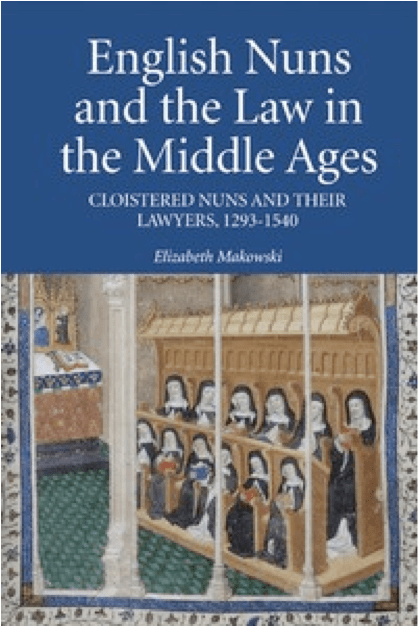 In the first part it looks at the six mendicant and Bridgettine houses established in England, and relates the effectiveness and resilience of their cloistered spirituality to the rise of legal professionalism in the twelfth and thirteenth centuries. It then presents cases from ecclesiastical and royal courts which illustrate the work of legal professionals on behalf of their clients.